First wave. First aircraft to attack Eder Dam. Mine dropped accurately but no breach caused. 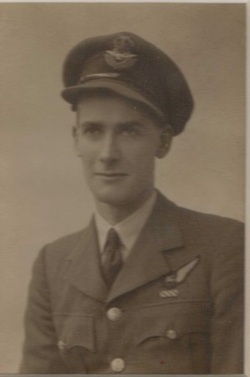 Brian Goodale was born in Hildenborough, Kent on 12 June 1919 and lived in a house in Riding Lane until he joined the RAF at the outbreak of war. After training as an observer, he became a wireless operator/air gunner and served a full tour of 28 operations in the Whitleys of 51 Squadron, starting in September 1940. During this time, he received the DFC and was commissioned. Then, after a period instructing, he was summoned to Scampton to join 617 Squadron when the call came to find an experienced wireless operator for the Shannon crew. Flt Lt David Shannon’s crew was only finalised three weeks before the Dams Raid with the arrival at Scampton on 20 April 1943 of wireless operator Brian Goodale. The crew’s members came from quite disparate backgrounds but nevertheless they worked well together and became an important part of the backbone of the squadron. Dedicated fighters in the air, they were serious revellers on the ground, and thereby added greatly to squadron morale. Goodale, tall and thin with a slight bent and thus known widely by his nickname ‘Concave’, was described by his colleague Len Sumpter as being ‘a bit of a character with a drink in his hand’. ​Shannon’s Lancaster, call sign AJ-L, was among the first wave of eight aircraft to attack the Möhne. Shannon was sixth in line to attack. The fifth in line was Lancaster AJ-J piloted by Flg Lt Maltby, their bomb scored a direct hit but the dam appeared to stay intact. Shannon was next up but as they were lining up for their run, the dam finally gave way so Shannon aborted the run. The three Lancasters that still had their bombs aboard (AJ-L, AJ-Z and AJ-N) then made for the Eder dam, 12 minutes away. Shannon in AJ-L was first to attack and made several aborted runs, struggling to get into the right position to release their bomb. AJ-Z, piloted by Sq. Ldr Maudslay had similar problems. Shannon then tried again and they scored a hit but the dam held. AJ-Z came around for another attempt and dropped their bomb which hit the top of the dam and exploded, damaging the aircraft in the blast. (They struggled on but were later hit by flak and crashed with the loss of all crew). AJ-N piloted by P/O Les Knight then made its run with Wing Cdr Gibson flying alongside to draw some of the flak away from Knight. The bomb bounced three times before hitting the dam bang on target. The bomb sank and exploded, successfully breaching the dam. AJ-L and AJ-N both made it safely back to base. Some of the escapades in which Goodale was involved after the Dams Raid have passed into Squadron folklore. Prominent among them is the trip by train from Lincoln to London for the investiture at Buckingham Palace, where he had to be locked in a lavatory after a drunken trouser-removing incident. Fortunately, Adjutant Harry Humphries managed to retrieve them, crumpled and dusty, before anyone became too offended. Many of these incidents were recorded by Paul Brickhill in his 1951 book The Dam Busters – items which add to its period charm. Goodale became the squadron’s Signals Leader in September 1943 and carried on flying operations with Shannon for another nine months until he was posted out to another training centre. He was awarded a bar to his DFC. He stayed in the RAF after the war and in 1949, met a 22-year-old girl called Vera and they married in August that same year. Brian retired from the RAF as a Squadron Leader in 1961. He then had a career in business, firstly as territory manager with Plessey, then in the late 1960s became the sales manager for the aircraft and armaments manufacturers Short Brothers & Harland in Newtownards, Northern Ireland. Five years later, the family moved back to Suffolk in England, where his wife was originally from. Brian Goodale died of cancer on 16th December 1977, aged just 58, in Bury St Edmunds, and is buried in All Saints Church, Hawstead, Suffolk. 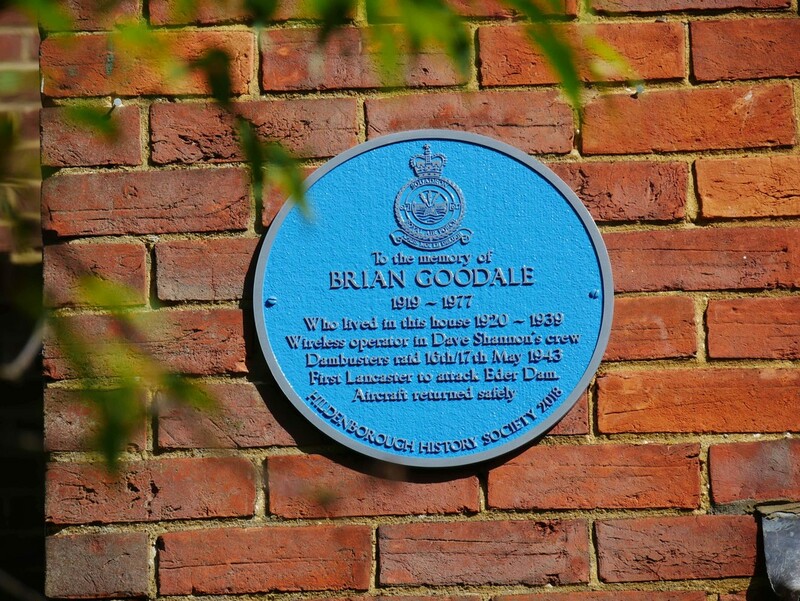 17th May 2018 was the 75th anniversary of the Dams Raid and Hildenborough History Society marked the occasion by dedicating a commemorative blue plaque to honour Brian Goodale, mounted on the house in Riding Lane where he lived from 1919-1939. HHS Treasurer Howard Dolling addressed the assembled throng, giving a short account of Brian's life and the part he played on the night of the 16th/17th May 1943. The commemorative plaque was then unveiled by Brian's widow, Vera, ably assisted by Howard. Brian's widow, Mrs Vera Goodale, and their son, Simon, standing proud beneath the plaque. Vera and Simon with Kath Barton and family, current owners of the house where Brian lived before joining the RAF in 1939. We were most honoured and very pleased to welcome a representative of the 2520 Tonbridge squadron Air Cadets, Flying Officer Tom Bristow. 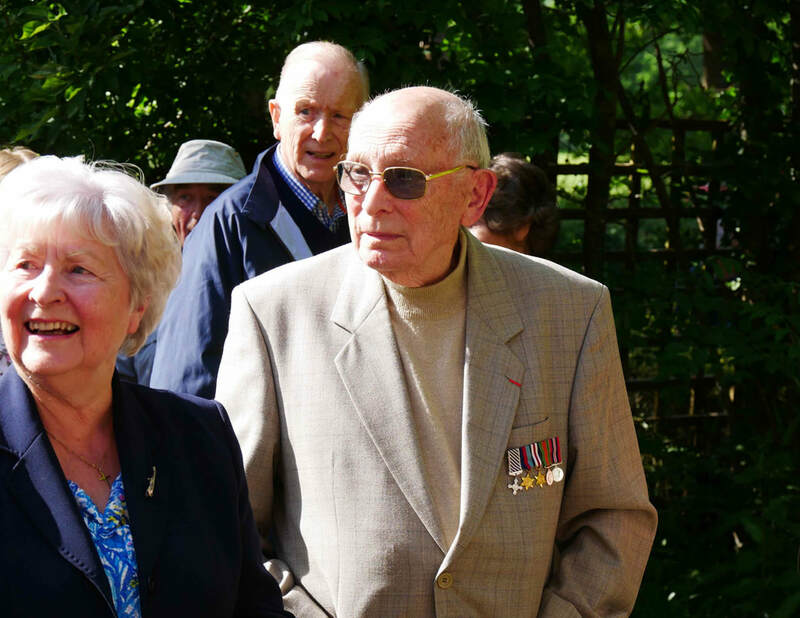 Also in attendance was WW2 veteran, Mr Tom Noton DFC. Tom flew Halifax bombers during the war. Some of the throng that turned up to honour the memory of Brian Goodale. R.I.P. Sir, we salute you. Photographs of the ceremony courtesy of Mellie & Jac Corbett.